Even as Donald Trump's surrogates are re-tweeting photoshopped images of Hillary Clinton in blackface, Trump himself is trying to win the black vote by simply asking black Americans "What the hell do you have to lose?!" And in response to the news that NBA star Dwyane Wade's cousin had been shot in Chicago, he sent out two tweets talking about how bad the crime rate is getting. The first one declared "Look how bad it is getting! How much more crime, how many more shootings, will it take for African-Americans and Latinos to vote Trump=SAFE!" And less than ten minutes later, he followed up with "Inner-city crime is reaching record levels. African-Americans will vote for Trump because they know I will stop the slaughter going on!". Last week, Trump vaguely explained to Bill O'Reilly how he would do that, "by getting very much tougher". But the truth is, Trump couldn't be more wrong about violent crime in America, because it's not at an all-time high, and it's actually nearly half of what it was when George H.W. Bush left office in 1993. In 1993, the first year that Bill Clinton took office, the FBI reports just under 2 million violent crimes, and over 24,000 murders. Over 20 years later in 2014, the FBI reported slightly under 1.2 million violent crimes, and only about 14,000 murders, meaning that the crime rate had been nearly cut in half! 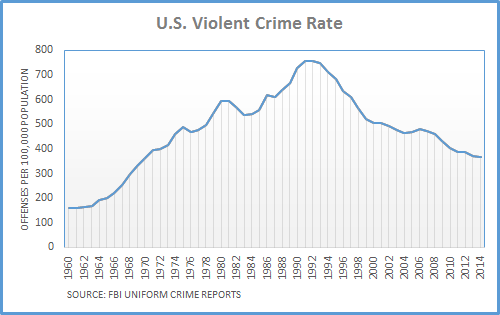 In fact, this graph shows that violent crime clearly decreased during the Democratic Clinton and Obama administrations, but it sharply increased during the Republican Reagan and H.W. Bush administrations. So Trump is wrong on at least two counts: violent crimes and homicides in America have been cut nearly in half over the last 25 years, and they've never fallen faster than during Bill Clinton's time in office. But that's not stopping Trump from using Chicago as his leading example of how inner-city crime is on the rise nationally. And he can do that because, as this graph shows, even though there's been an absolute decrease in violent crimes in Chicago over the last 25 years, the homicide rate in Chicago has been on the rise since 2014. But it's really hard to imagine how Chicago could get tougher on crime anyway. The Guardian reported last year how Chicago's police department already runs what is essentially its own CIA black-site at "Homan Square", where police unconstitutionally detain, interrogate, and torture suspects or witnesses before ever officially booking the person with a crime. It basically treats everyone who is not a Chicago Police Officer as though they are an enemy combatant who is not protected under the U.S. Constitution, and it's hard to get much "tougher" than treating civilians like enemy combatants. And in all likelihood, taking a "tougher" approach to crime would probably lead to even more crime!. Because the problem in Chicago and other cities around America probably has less to do with police forces that are too soft, and more to do with inner-city environments that present people with few opportunities to break out of poverty and lead a fulfilling life. In his somewhat controversial "Rat Park" study, Dr. Bruce Alexander demonstrated with two groups of rats how addiction might be, in part, a response to stress in our environment. One group of rats lived in standard one-square-foot rat cages, and one group lived in a 200-square-foot "Rat Park" that had plenty of food, balls and wheels for play, and private places for mating and giving birth. Both groups of rats had the choice between plain tap water or a mixture of morphine and sugar, and Alexander hypothesized that if the standard "disease model of addiction" were correct, both groups of rats would end up choosing the morphine and sugar mixture. But the team found that only the rats in the miserable, small cages became addicted to the morphine, and Alexander wrote that "Nothing that we tried, … produced anything that looked like addiction in rats that were housed in [the] reasonably normal environment [of the rat park].". We can look at violence and addiction as different responses to the same crisis of opportunity: where an addict numbs himself to the lack of opportunities, a violent person lashes out because of the lack of opportunities. And that's more likely the root of why crime is on the rise in certain American cities. Many of America's inner-cities, particularly those that once had an industrial base, don't offer real social or economic opportunities for individuals: the jobs have been sent overseas; communities and families have been broken up by violent and systemically racist policing; and one recent study showed that nearly half of the adults in Chicago are spending more than they can afford on housing. Donald Trump is wrong about the national crime rate, and he's wrong to insist that the best way to curb crime in America's inner-cities is with "tougher" policing. If we really want to tackle crime in America's inner-cities, we need to totally transform the communities to create opportunities that allow people to live truly fulfilling lives, free of constant economic uncertainty and police harassment. We need to transform our inner-city "cages" into the equivalent of the "Rat Park." That means putting people back to work, rebuilding the infrastructure, creating livable affordable housing, and providing real economic opportunity to these communities. FDR was right, the best welfare program is a job, and when no one else is hiring, the government needs to step in as the employer of last resort. If the next president really wants to curb crime in America's inner-cities, he or she will need to tackle unemployment by launching a massive public works program on the scale of FDR's Works Progress Administration to create real opportunities in inner-city communities across the country in cities like Chicago, Baltimore, and Detroit.